The final stop in my three country Europe circuit was Pristina (or Prishtina) in Kosovo. If Macedonia is partly defined by opposition from Greece (they don’t like the name), then Kosovo’s problem neighbour is Serbia (they think Kosovo should be part of Serbia). I travelled around and, on two occasions, right through the old Yugoslavia in the very late ‘60s and early ‘70s, but had I been to what is now Kosovo? 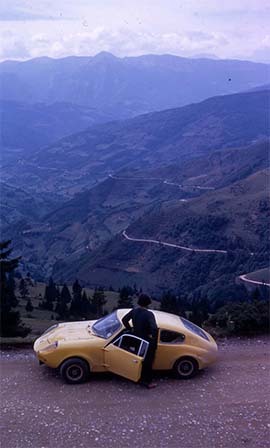 ◄ A glance at the map showed I had, in late ’69 in the Mini Marcos I’d built myself I drove down the Yugoslavia coast and from what is now Montenegro climbed up and over the Čakor Pass into what is now Kosovo and on south into what is now Macedonia. ▲ This time I came by train from Skopje in Macedonia. It’s hardly a fast trip, three hours for the daily service connecting two cities less than 100km (60 miles) apart. 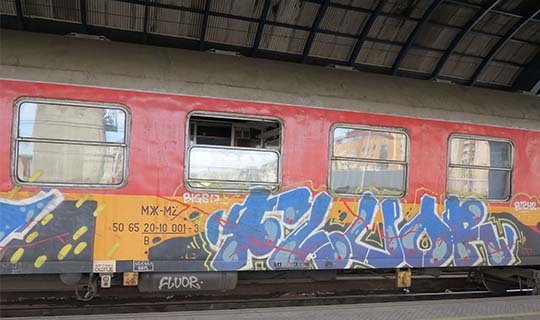 Local trains from the Skopje station seemed to be fairly modern affairs, but when the ‘International Fast’ Pristina train pulled in it had a single graffitied carriage. That was quite big enough, only a half dozen passengers climbed on board. Our US$2 fare only took us 20km, to the border where, after our passports had been stamped, we transferred to a slightly more modern-looking Kosovo train, bought another €2.50 ticket and continued as a local service, picking up and dropping off passengers the rest of the way. 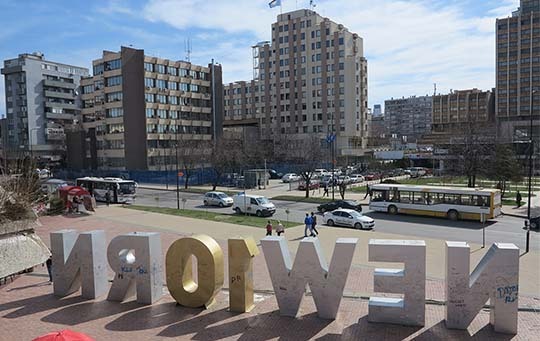 ◄ Pristina was a surprise, modern and relatively affluent looking, not what would probably be the poorest country in Europe if Moldova hadn’t undercut it. The answer is probably and economy driven by a lot of European and UN aid. 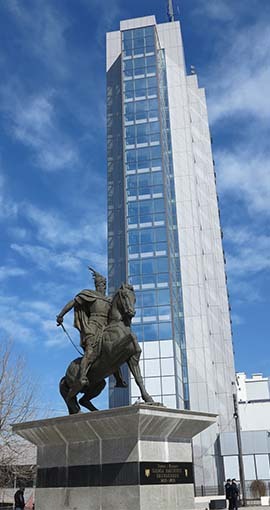 In the pedestrianized central Bulevardi Nënë Tereza an equestrian statue of Skanderbeg rides in to battle. He’s the Albanian hero who fought the Ottoman Turks (earlier on he’d fought for them) and thus is seen as a Christian hero against Muslim incursion into Europe. The Albanian (Muslim) and Serbian (Orthodox Christian) friction is at the heart of Kosovo’s problem. Incidentally Mother Teresa is another local hero and she’s everywhere in this region, the Albanians claim her although in fact she was born in Skopje in Macedonia. 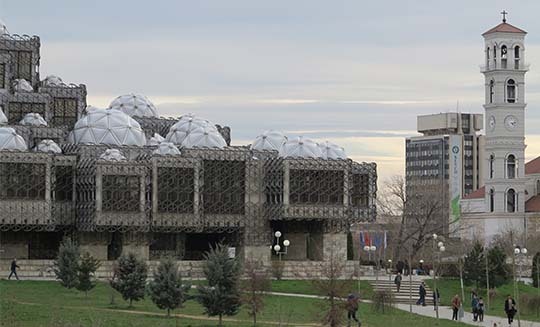 ▲ The quirky National Library of Kosovo building and the tower of the Mother Teresa Cathedral. 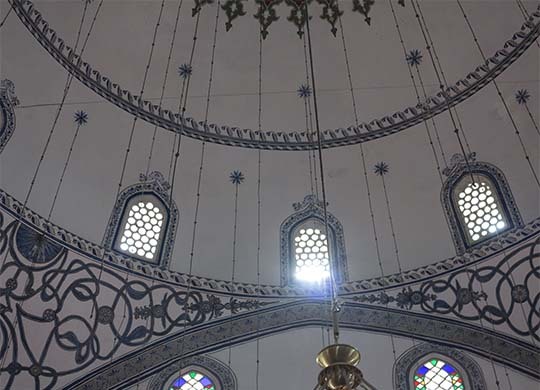 ▲ Turkey seems to have been putting money into restoring Pristina mosques, this is the Sultan Mahmet Fatih Mosque. ▲ The NEWBORN monument spelled out the word to mark Kosovo’s independence from Serbia in 2008. Recently it’s been updated to mark the country’s 10th birthday, now it spells NEW10RN. Either way it’s covered in graffiti from the front. ◄ Across the road the Heroinat Memorial stands for the women who suffered and fought during the 1998-99 Kosovo War. 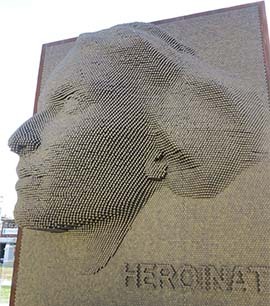 It’s made from 20,000 medals for the 20,000 women who a Human Rights Watch report said were raped during the conflict. ▲ The Gračanica Monastery, on the outskirts of the town, is a happier place to finish my Pristina visit. 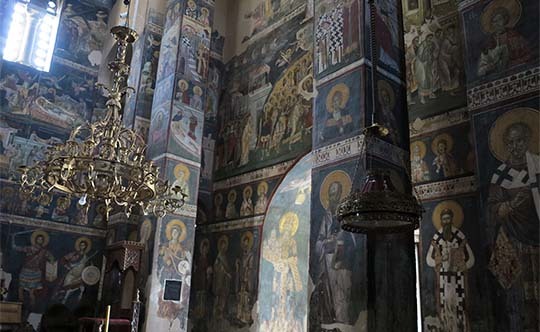 Built in 1321 on the site of a much earlier basilica the monastery’s squat, multi-domed Orthodox church is totally covered inside with beautiful frescoes. It’s on the UNESCO World Heritage list.